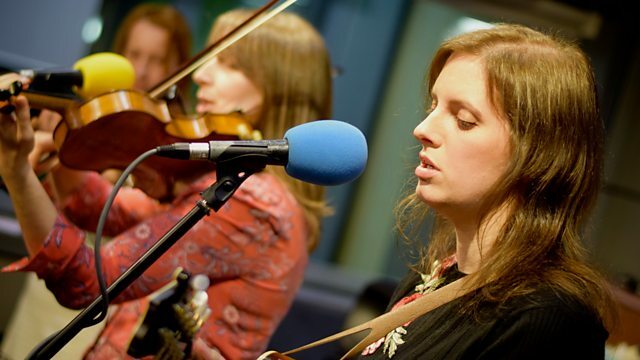 British six-piece The Shee play live in the Salford studio. This week, British six-piece The Shee play live in the Salford studio. The group have celebrated their 10th anniversary this year with a project called Continuum, in which they asked six of their favourite folk musicians to compose pieces for them to perform. The pieces were written by Karine Polwart, Brian Finnegan, Chris Wood, Kathryn Tickell, Martin Simpson and Andy Cutting. The Shee are Amy Thatcher (accordion, clogs), Laura-Beth Salter (mandolin, vocals), Lillias Kinsman-Blake (flute, whistles), Olivia Ross (fiddle, viola, vocals), Rachel Newton (electroharp, vocals) and Shona Mooney (fiddle). Continuum was released on the 23rd September 2016. Boots No. 1: The Official Revival Bootleg.